Do you find yourself overwhelmed by the amount of stuff you own? 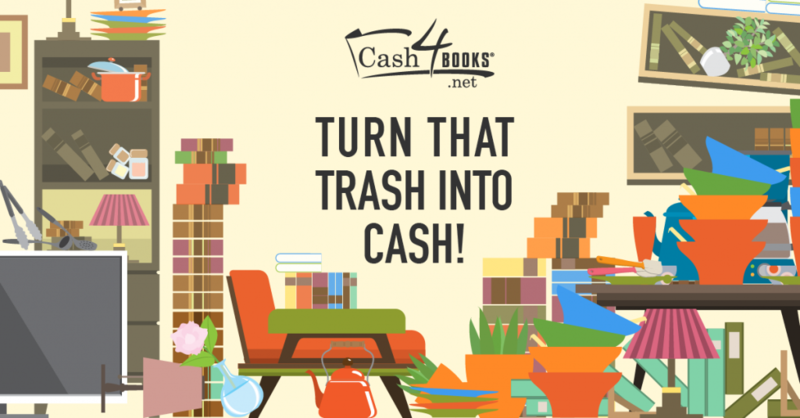 Nothing to fear, Cash4Books is here! In the past, we’ve put together lifehacks to make you cash online, but this list is all about your IRL stuff. Is your closet overflowing with clothes? Do you wear ALL of them? Probably not. If you haven’t worn a piece of clothing in a year, you really don’t need it. While some old clothes may just need to be donated, the stuff you haven’t worn much can be sold. A great way to make some extra cash is to search out your local vintage and second-hand shops and see which items of clothing they’ll buy. There are also multiple places to sell your old clothes online. Poshmark, Twice and eBay are all good resources, to name a few. Go get ‘em! If you recently bought a new phone, tablet, computer or other electronic device, you probably don’t need to hold on to your old device. Old electronics often take up space, go unused and run out of batteries. While your devices are still in working order, you should sell them online for cash. While ink cartridges don’t take up much space, they do make clutter and are worth cash! You can turn them in at office supply stores, like OfficeMax and Staples. These stores will usually give you around $2.00 per cartridge. Alternately, you can sell them on eBay or to a specific ink cartridge buy-back site like eCycle Group and Toner Buyer. It’s not the most innovative of ideas, but garage sales can be highly effective! Not only does it require you to get your stuff in order and decide what you want to keep, you get to make cash in the process! Making signs and posting about your sale on social media are both good strategies to having a successful sale. If no one knows about your garage sale, no one’s going to stop by. Your used textbooks are hidden gems! Books you haven’t used since last semester’s final exam can be turned into cash, and won’t clutter up your space. Input your textbooks’ ISBNs here at Cash4Books homepage and we’ll give you a price quote. From there, you ship them to use for free, and we’ll send you the cash! Now that you have the secrets to turning trash into cash, what are you going to sell first?